People who drop by Dube's General Store here expecting to see a ghost town might leave disappointed. But if proprietor Moody Anderson is there, the visitor won't leave uninformed. Anderson is the owner of the store, which he bought lock, stock and cracker barrel in 1972. Then he stocked it with everything from candles to coffins. The only place you are likely to find more one-of-a-kind antiques is at his private warehouse west of Austin. Writer T. Lindsay Baker included The Grove in a book he wrote on "Ghost Towns of Texas." Anderson tried to dissuade him of the notion. "I told him that his idea of a ghost town and my idea of a ghost town must be about 180 degrees different," Anderson says. "A ghost town is abandoned. Nobody ever goes there. That's not the case here." Indeed, The Grove is the scene of a lot of pickin' and grinnin' especially on Jamboree night the third Saturday of each month. Once a year, when The Grove celebrates itself with The Grove Homecoming the town swells to many times its normal size. This year's celebration begins October 8 and continues the next two days; Saturday the ninth is the big day, when a parade kicks off the celebration. Residents - real ghost towns don't have residents - marvel that the 76-year old Anderson conducts all the business on Jamboree night himself, including the lifting and toting. He stays until people are ready to go home, then puts up the chairs and closes up. More often than not, he sleeps upstairs in a restored turn-of-the-century doctor's office. Anderson started his extensive and unique antique collection about fifty years ago with some antique blacksmith tools. Today a partial inventory reveals cigars, Arbuckle's coffee, cholera tablets, chill tonics, cough syrups, collars and hairnets, pots, pans, singletrees, tethers, tobacco powder and grits and groceries of every description, all of it dating back to 19th or very early 20th century. Anderson's collection has provided movie companies with an almost endless supply of props, especially for projects with a historical setting like "Lonesome Dove" and "The Newton Boys." Cary White, a production designer for the movie "American Outlaws," said in a 2000 Austin Chronicle interview that he has been working with Anderson since 1988, when Anderson opened a little shop on South Congress called The Texas Trader. "Moody's a wonderful guy, and because of him it's been possible to make movies in this town," White said. "I credit Moody with a lot of the success the film business has had in this town." Anderson likes working with the movie companies but said he much prefers the laid-back and down home atmosphere of The Grove to Hollywood. The Grove, named for its large stand of live oak trees, sits just off Highway 36 on the fertile, flinty edge of the Leon River Valley. Anderson notes that the town's first well was dug with a pick and crowbar by Jim Whitmore in 1872. Anderson says the first 12 feet consisted of almost solid rock, but at 28 feet Whitmore hit a source of water that has never run dry, not even during the most severe droughts. The town soon grew to more than 400 people and had three cotton gins and a slew of stores. "I've got pictures of the cotton wagons lined up from Wolfe's gin all the way down this road," Anderson says. In 1936, the Texas Highway Department (now the Texas Department of Transportation) told the people in The Grove that they would have to cover the well if they wanted Highway 36 to run through town. People in The Grove refused to cap the well, which still provides water today. That's why The Grove sits a little way off the main highway. The town held on, but was hit with a double whammy. First, Fort Hood took about 250,000 acres from area farmers and ranchers. Then 50,000 more acres disappeared under the waters of Lake Belton. Still, the town has survived. In addition to about forty residents, the community has a post office, bank, ice house and meat locker, all circa 1900. The upstairs doctor's office is dedicated to J.J. Mitchell, the town's first doctor. 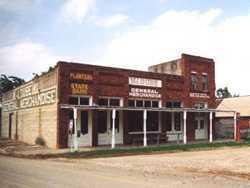 Other buildings include Holcomb's blacksmith shop and the Cocklebur Saloon. For a few years now, Anderson has talked about hanging it up. But so far all he has done is talk. "I can see selling it in a few years, but I want to sell it to somebody who will keep it going," he said. "I'd hate to see all this auctioned off a piece at a time."